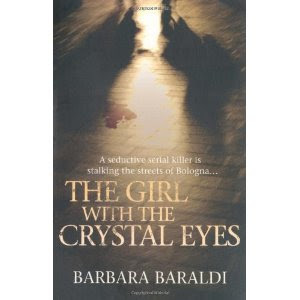 The publisher of the newly translated (by Judith Forshaw) The Girl with the Crystal Eyes, by Barbara Baraldi, pitches the novel as the story of a female Hannibal Lecter, and the novel itself includes a sly mention of Carlo Lucarelli's female cop in Bologna, but Baraldi's novel bears little resemblance to Lecter or Lucarelli's books. It's a book that will disappoint anyone expecting a realistic and straightforward crime novel, but it will reward anyone willing to go along with Baraldi's impressionistic, allusive tale. 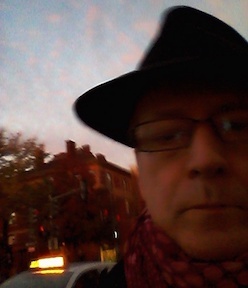 Someone is murdering men who have attacked or threatened women, and we see some of the crimes from the point of view of the unnamed woman committing the crimes. Other chapters follow two women, Eva and Viola, one of whom is a shy young single woman working in an ad agency and the other is kept at home by her mostly absent fiance, as well as the point of view of a detective working on the murders. The tale is told in very short chapters with extremely short paragraphs (frequently single sentences), with some dialogue (though not a lot) and little evocation of Bologna (except for mention if the city's arcades). The puzzle is as much "what's going on" as "who's the murderer," and the reader's sympathy is with the killer more than the victims. A reader will most likely have figured out the "who" before the end, and the "what" also gets clearer, but there are some surprises remaining at the end, as the detective has gotten a result that he doesn't much believe in. There's a genre of crime fiction more typically European than U.S.-U.K., an approach to fiction that is psychological and metaphorical rather than gritty and realistic. Though this style is not my usual cup of tea, The Girl with the Crystal Eyes kept my attention, partly through keeping me interested in how the murderer got to the point of becoming a serial killer, and partly from the appealingly cynical attitude of the narrator, who floats above events with an omniscient, jaundiced eye. The characters, too, sketchily but effectively drawn, are not so much likable or individualized as sympathetic in their representation of recognizable social situations. Baraldi skilfully lays out her story in short brushstrokes, skilfully guaging her appeal to the reader's interest at every stage, and skilfully keeps the story moving rapidly forward. It would be interesting to know what Baraldi's other works are like (she's evidently a well-established crime writer in Italy), if anyone has any inside knowledge. Based on The Girl with the Crystal Eyes, she's a quite different voice in Italian crime fiction than the noir and policier writers that we have previously had access to in the English-speaking realms. A quick search in WorldCat gives us 6 works, including the translation into English : http://www.worldcat.org/search?q=au%3A%22Baraldi%2C+Barbara.%22&qt=hot_author. I've got this on my shelf to read, was thinking of taking it on holiday, though am slightly put off by the female Hannibal Lecter angle! But I did like Red Dragon/Manhunter (perhaps because HL did not feature in it very much) unlike the follow-ups, so maybe there is hope.